Kai Kudou, a member of the elite Ashurum psychic group, is sent on a mission to take custody of unregistered, illegal psychics in the city of Gald. 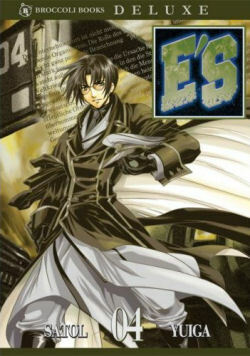 Straying from his companions, he's taken in by Yuuki Tokugawa, an odd-job man working for the guerillas fighting Ashurum. As Kai spends more time with Yuuki and his mysterious sister Asuka, Kai starts to wonder whether Ashurum's purpose is to protect the psychics or control them. In this entry in the best-selling series, the search for the Sacrament of Calvarias get complicated when Yuuki and Asuka are attacked by rebel psychics and must join forces with Maria and the guerillas to survive. Meanwhile, Kai finds himself in a world where psychics fight bloody battles for the glory of their religion and the greed of the wealthy. Back in Ashurum, Shen-long wonders what's wrong with his sister Shin-lu, and who are those three strange new recruits on their team?